Inspired by Brooke to do art with babies, I decided to let the baby storytime folk get in on the storytime postcard project every storytimer in my library did for the last weeks of storytime. 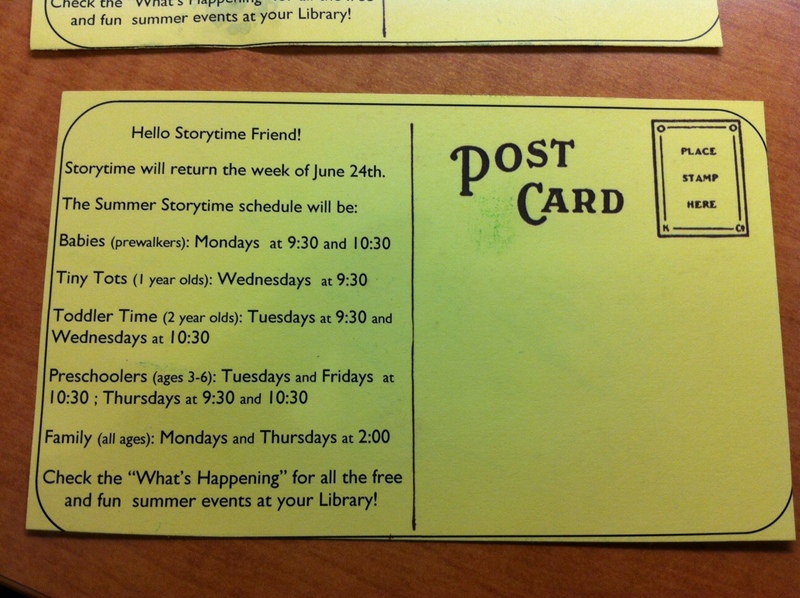 Basically, we take this awesome postcard with all the information for when storytimes start back up again in 5 weeks (!) 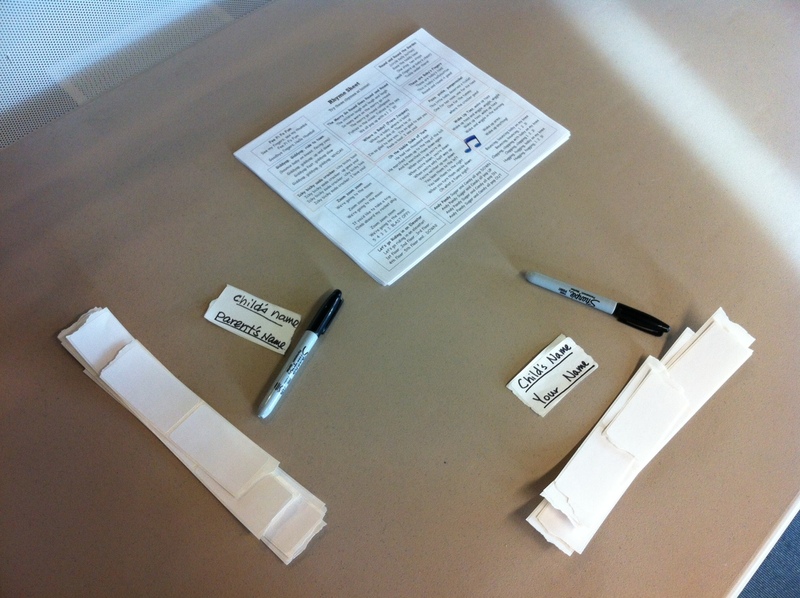 and a spot for kids and parents to decorate and write their address. Then we mail the postcards to them! I’m not sure which of my clever co-workers came up with the idea, but it’s genius. First, everyone LOVES getting mail, especially when it’s informational. Second, everyone LOVES their kid’s artwork. So getting kids’ artwork in the mail? Pure genius, I tell you. 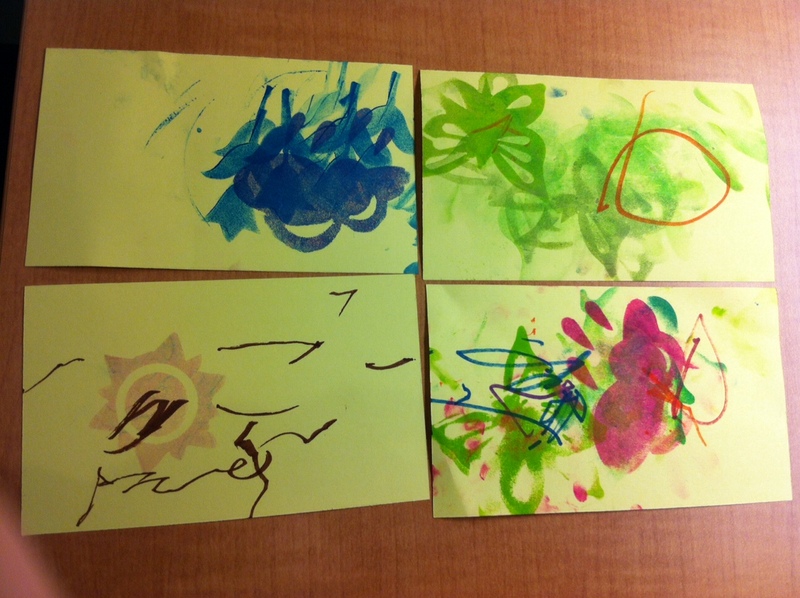 The older kids had markers and small stamps to decorate their cards, but for the toddlers and babies I went with jumbo washable stamp pads and oversized stamps (for toddlers) and their hands and feet (for the babies, mostly, though many a toddler contributed their adorable handprint). When doing this with the babies I passed out a tray with a jumbo stamp pad, postcard, and pen so each adult had everything they needed within reach. I also had a big container of wipes to pass around for wiping ink off hands and feet. I was sure to tell parents how completely washable the ink is (it is REALLY easy to wash off) so not to worry about it getting on our carpet or their clothes. 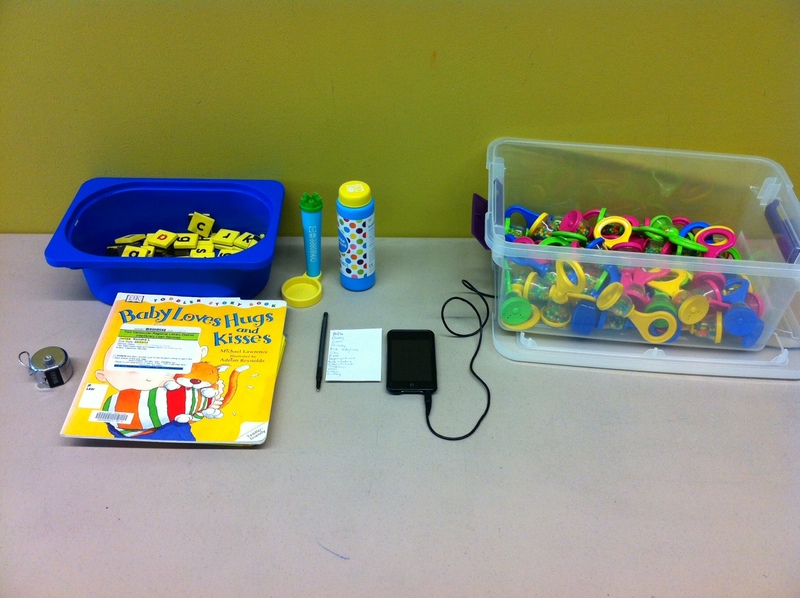 Here are some left behind examples from toddler and baby time. I’m calling this a success and plan to do more art with the tiny guys-probably once a month to start. Can’t wait! 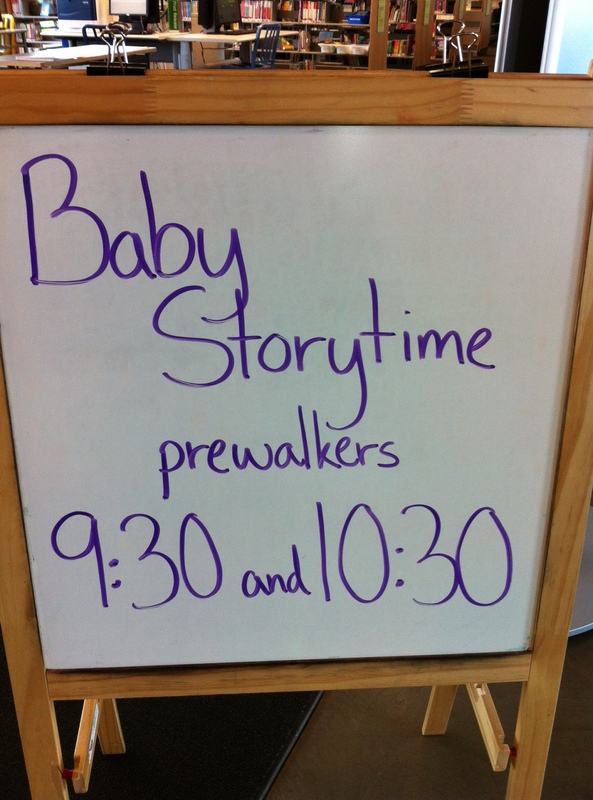 Categories: Baby, Storytime | Tags: babies, crafts, story time | Permalink. It’s been a while since I’ve done a baby storytime post-just not enough time in a day. Thanks for sticking with me! Parent Message: It’s ok if they crawl around while we’re reading and rhyming. Just because they aren’t making eye contact, doesn’t mean they aren’t absorbing what we’re doing and saying. We want to make sure books and reading are FUN so we’ll let them participate at their own pace. You can just do what I’m doing if your little one leaves your lap. Today’s agenda was packed! And so much fun! Categories: Baby, Storytime | Tags: babies, literacy, rhymes, songs, story time | Permalink. Seeing how others set up the room, etc. was so helpful to me when I started doing baby storytime 5 years ago. 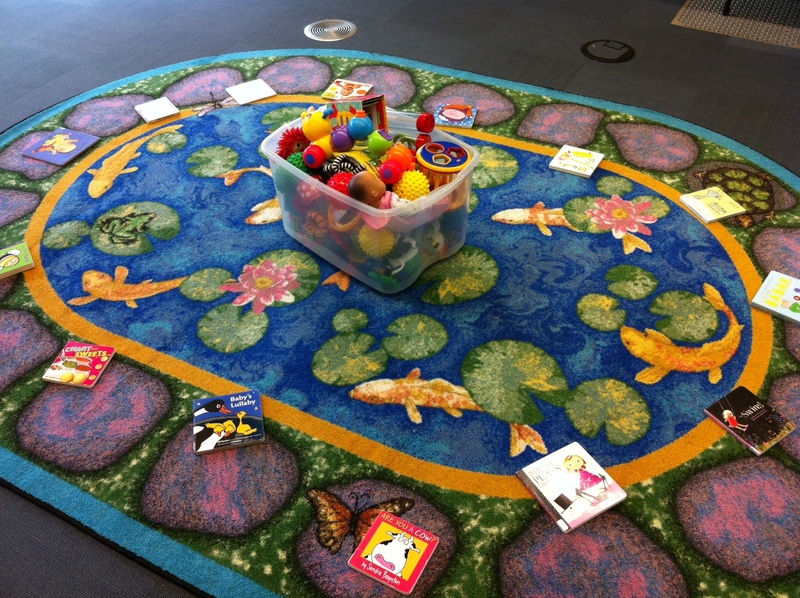 Little things like nametags, words on the wall, and what goes on the floor make a big difference in storytime. If you’ve never seen a baby storytime the set-up part can be hard. There are lots of storytime plans out there for content, but how do you arrange the babies and the grown ups? Do put things on the floor? What things? How can I make the room welcoming to participants? I’ve been setting up this way for many years and it has worked really well. I didn’t always have books on the floor during storytime but added those a few years ago because not all babies are the sit and listen types. It’s nice to give them something interesting in the center of our circle to play with and look at while we are singing and rhyming. They’re still soaking up everything we say and they’re happy not being trapped in a lap (and mom’s comfortable knowing he isn’t escaping). Decided to get brave and try Vine (thanks, Mollie for your help!) instead of using just pictures. Magnetic wall makes hanging songs up SO easy! 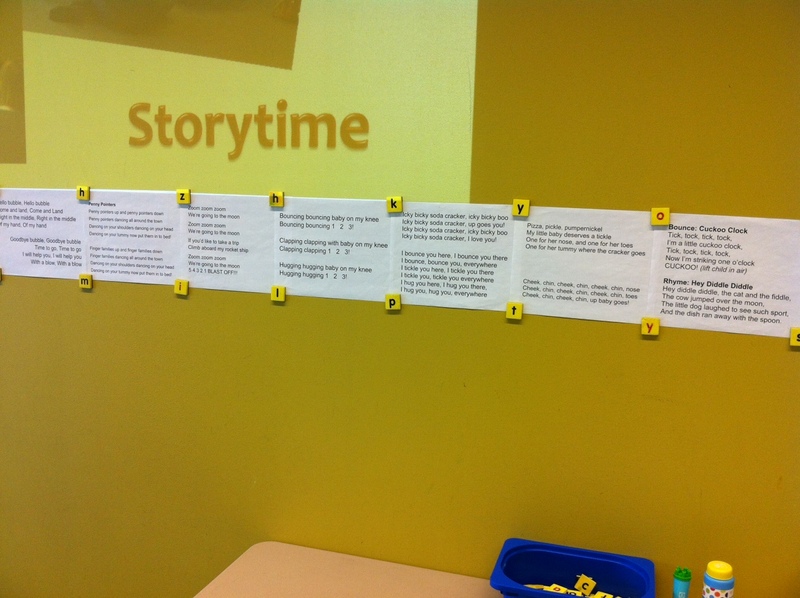 How do you set up storytime? Categories: Baby, Storytime | Permalink. With all the talk on the listservs recently about using the parachute in storytime, I thought I should blog about my experiences with the parachute. I’ve been using the parachute in storytime for less than a year but had a lot of help from fellow bloggers and tweeps when I was getting started. This is me paying it forward. I’ve briefly mentioned using the parachute in other posts here, here and here, if you’d like to see how it fits in to storytime, but thought it might be helpful to have all the activities I have used in one spot. Plus, I’ll talk more about set-up and adjusting for group mood. Set up for prewalkers: invite parents to lay their babies on their backs so they will be able to see the bright colors as we lift and lower the chute. It’s very typical to have a baby or two NOT interested in being out of mom’s lap. That’s OK. They can sit in a lap and enjoy the parachute just as much. Set up for wobblers: allow babies to crawl or lay under the chute and let grown ups know it’s ok for them to crawl under the chute and grab their baby if he or she is in distress, or for any reason at all. Alternatively, you can place wobblers on TOP of the parachute and ask grown ups to stand, pulling the side of the parachute up around the baby pile in the middle. This provides a barrier so if they stand up they will fall back on the soft wall of the parachute, not on the hard ground. This set up makes it possible to take the babies for a ride on the parachute. If you’d rather they not go for a ride you can still sings songs with babies crawling and walking on top of the parachute. 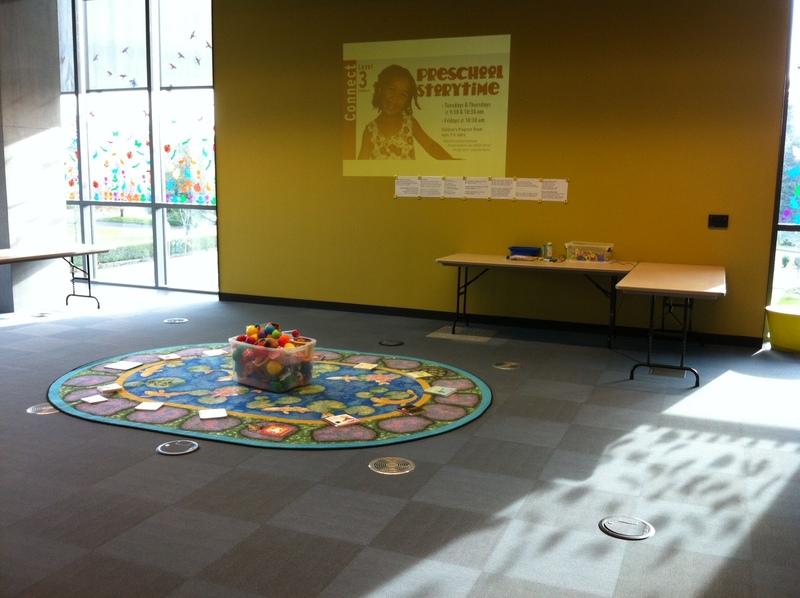 Set up for toddlers: With a small group you can do any of the same set ups mentioned previously. With a very large group I feel it is safer, and easier to manage, if children are on top of the chute. Ask grown ups to scoot back and spread the chute in the middle of the floor. This usually requires temporarily re-locating toddlers so I usually ask grownups to grab their children while we are spreading out the chute. I just move any stragglers myself. Once the chute is laid out, release the toddlers! 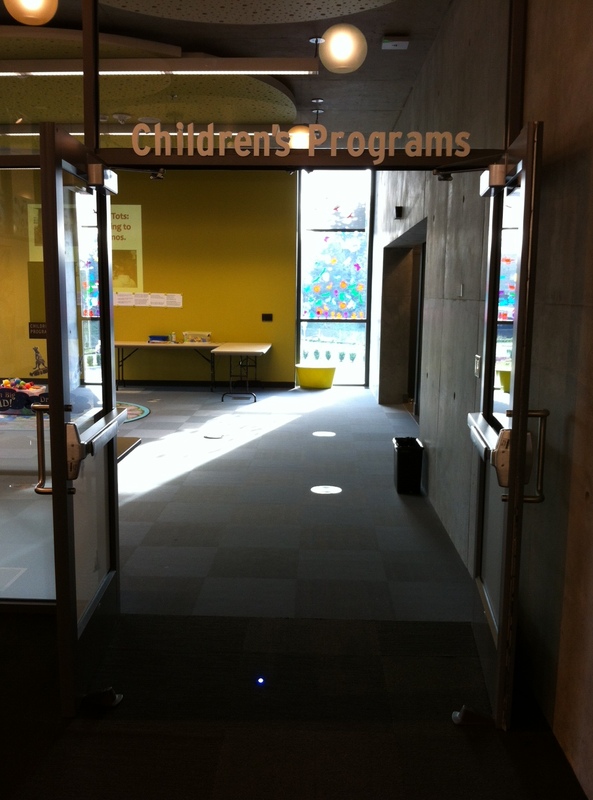 -Ask parents to hold the chute high enough that adults can maintain eye contact with their child. While the chute is up you can ripple it gently while singing. You will only want to do one, maybe two short songs this way as grown up arms will get tired fast. This works especially well for babies on their backs. -Put kids on top of the chute. This is the easiest way to put nervous children at ease. This way they can walk or crawl back to their adult if they get nervous, or stay sitting on a grown up’s lap without missing any of the action. -Go Slow. And avoid any loud parts of songs like Ten Little Bubbles (just don’t slap the floor on POP!). These are songs I have used successfully in storytime (more will be added as they are discovered/used). Click the links for lyrics (and to hear me singing some of them-for educational purposes only). Itsy Bitsy Spider (also in Spanish on the Rhymes page) Thanks, Kelly, for reminding me of this one. I’ve yet to meet a baby who doesn’t like this song and most people know it so it’s perfect for the parachute. Merry Go Round This is a great one for taking them for a ride. Pull up the sides and walk in a circle while singing. Mix a Pancake A chant instead of a rhyme, but fun to build suspense to the toss (lift). Noble Duke of York Instead of lifting a child to this song, lift the chute. Gently shake in between lifts. Peek a Boo Self explanatory-try to lift on “Peek-a-Boo” if possible for extra fun. Pop Goes the Weasel Another one for taking a ride. Could also just walk in a circle holding the chute. Rain is Falling Start with the chute as high as possible (you can even start standing) and bring it down slowly until it covers the kids. Roly Poly I really like to do this with kids who are used to the chute as you can make some pretty forceful wind by lifting and lowering the chute fairly quickly. Just be careful not to knock over walkers with a gust! I usually ask them to sit for this song. Row Boat, Row Boat This came from the twitterverse (Thanks, Anna!) and works so well with the chute! Ten Little Bubbles They LOVE this song. Something about bubbles while standing on a parachute really does it for toddlers. I ask the parents to sing this one for me while I blow bubbles. I sing it with them the first time, get them started the second time, and then they’re on their own! They’ve yet to let me down. On the Pop, pop, pop line we slap the chute with our hands to make ripples and a great loud noise. These are the Colors Over You If they are standing on top of the chute change this to “under you”. This is a great introduction song as it’s both soothing and to a familiar tune. We sing this song every time I bring out the chute. Wheels on the Bus This is a good one for standing so you can actually go round and round, open and shut (in and out), swish, swish (side to side) but you could do most those sitting as well. The up and down verse works especially well. Thanks, again Anne for this idea! Where is Baby? Another fun peek-a-boo song! 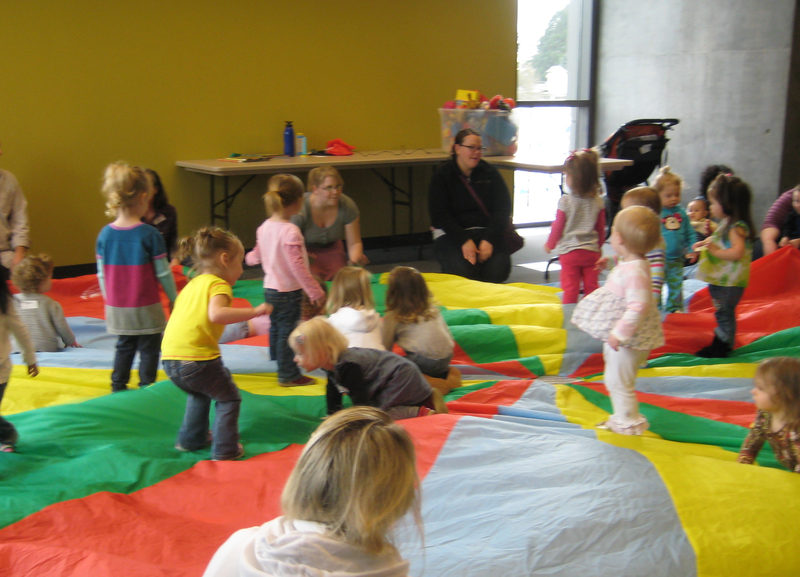 What are your favorite songs/activities for the parachute with the under 3’s? Categories: Baby, Other Library Stuff, Storytime, Tiny Tots, Toddler | Permalink. Sometimes there are things you do all the time in storytime, or in life, not realizing its any big deal. Singing a book is one of those for me. Maybe it’s because it’s totally something my mom would have done with me (did you ever sing a book with me, Mom?) or because there are so many beautiful books out there to go with my favorite songs. No matter the reason, singing a book is actually easier for me than reading one, especially with babies and toddlers. Though you can ask open-ended questions, point to words, and do a whole host of other things to promote early literacy with babies, those things are really more effective (at least immediately) with preschoolers. I’ll spend a lot of time talking about a page with 4 and 5 year olds, but a baby isn’t going to last that long. So, reading to babies has always made me feel like there’s empty space I need to fill with conversation. I know it’s just me and caregivers don’t notice anything awry, but it’s always a little off for me. Reading one on one, no problem! To a group of babies? Oh boy! Something about singing, though, makes the experience feel fuller. It takes more of me to sing so I don’t have the time to think about whether we should quack like a duck. It’ll either happen (and some caregivers might quack while the rest of us sing), or not, but we’re developing language skills either way. Due to this about 90% of the books I share in storytime are songs, rhymes, something I can turn in to a chant (like Monkey and Me), or I create a sort of rhythm with (I Went Walking). Before I did this regularly, I tried all the baby books my peers were sharing and didn’t feel comfortable. I was singing a book here and there, but still mostly reading them. I finally took my own advice (do what YOU love and are excited about) and now use this method weekly. Some storytimers say they are worried about overusing it, but now that I’ve been at it for several years, I don’t worry about that at all. How can you overuse singing? Besides, babies, and parents, really respond to a rhythmic book. Babies kick their legs and grin, moms and dads sing along, grandmas rock back and forth. When I look around the room and see only happy, peaceful faces I know I’m doing something right. So, as Julie, Anna, and so many others have said (see Julie’s post for a list of other posts on the topic), SING! This is my favorite version for little guys but it is sadly out of print. Any version would be fine to sing with, though. If you don’t know the tune you can hear Burl Ives sing it here. Though no one sings it like my Mom, he’s a close second. Categories: Baby, Other Library Stuff, Storytime | Permalink. Back after a week off. Here we go! Group Picks: no sharers this week for the first time! We sang You Are My Sunshine and Twinkle Twinkle Little Star. Playtime! And new book show and tell including I Ruff You by Sandra Magsamen. It has ears!! Your Valentine from me this year is another video! This shows three stand up rhymes we do pretty regularly. This was only the second time we’d done them. It works really well with a small group like this, but we’ve done them with very large groups as well and just have them spin in place or make several smaller circles with the parents around them. Lots of fun! 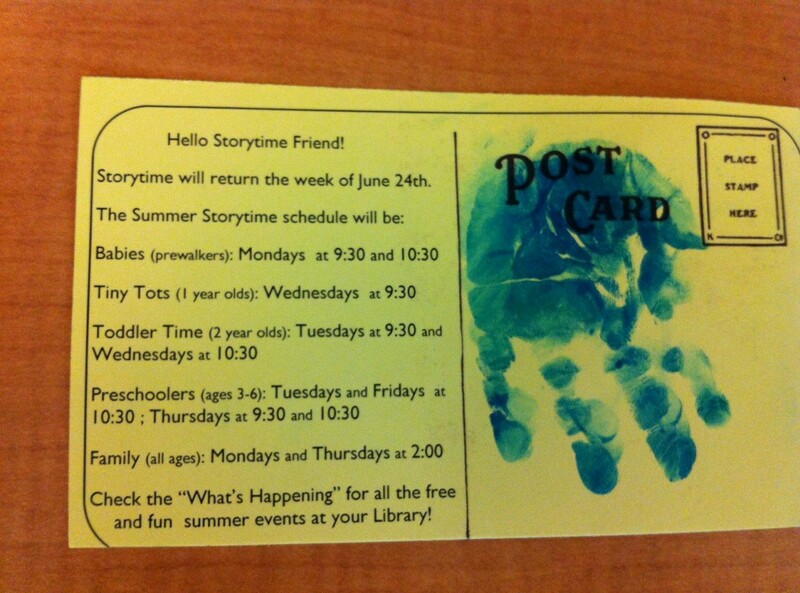 Categories: Baby, Other Library Stuff, Storytime, Tiny Tots, Toddler | Tags: babies, rhymes, storytime | Permalink.